I must admit that I may have developed a bit of a crush on the kitty I'm interviewing today, but one look at his pictures and I'm sure you'll understand why. Many of you are probably aware of the history of the Algonquin Cat at the famous New York City hotel. Some of you may have even had a chance to visit one! Well, there's a new cat in town named Hamlet and he is a total hunk!!! (Sorry, that sounds pretty unprofessional of me, doesn't it?) Interviewing him via email was fun, but I sure would love to meet him "in the fur" one day! Welcome, Hamlet! Thank you so much for taking time out of your busy day to chat with me. Could you start by telling us what you remember about your earliest days in a Long Island feral colony and how you came to be rescued by Bidawee animal shelter? I was spotted on a windowsill in Hempstead LI – taken to a shelter and ended up in Bideawee. I know I was part of a feral colony as my left ear is tipped which signifies I was trapped, neutered and returned. How were chosen for the great honor of becoming the Algonquin Hotel's 12 feline ambassador (and 7th Hamlet)? I am Hamlet the 8th !!! Matilda was ready to retire so my FURiends at the Algonquin called Bideawee to see if an orange male cat was available. They thought it would be fun to have a Hamlet since there were just three Matildas. I had just arrived (June) and they came to meet me. My PURRsonality won them over and I went to live at the Algonquin in July training and by mid September I became the full time ambassador. The tradition of The Algonquin Cat dates back to the early 1920’s. The hotel’s first cat was named Billy, who lived in the hotel during the famed Round Table of the 1920’s. In 1933, two days after Billy passed a stray cat wandered into the hotel looking for shelter. He was immediately welcomed to stay and named Rusty. Algonquin Resident, John Barrymore felt this name was too common for a cat residing in such a prestigious hotel. He then renamed Hamlet in honor of Barrymore’s greatest stage role. The tradition of the Algonquin Cat was born and over 96 years the hotel has had eight Hamlets and three cats named Matilda. Why are all the boy kitties named Hamlet and the girls Matilda? During your "settling in" period, did you receive any advice from the late, great Matilda? Matilda was very charming and taught me all the ins and outs of the job. In between naps I enjoy my meals, playing with FURiends and greeting guests. Do you have free reign of the hotel so people can visit you at any time, or do you make scheduled appearances to your adoring public? I am out and about at the Front Desk area 24/7 (except when napping). Is there anything about your job that you don't enjoy? I don’t like when people try to pick me up or poke me while I am eating. What are some of your favorite foods, toys, and napping spots? I love ALL food but Bonito Flakes, Temptations and Lickable treats are top on my list – My tree house and sleepy pod are nap winners and wands and balls win it for toys. Just between you and me, do you ever get into any mischief or are you strictly a professional? Don’t tell but I am a cat – therefore curious and go places that surprise people. What do you have coming up on your social calendar? Will you be hosting the annual cat fashion show fundraiser this year? And what about the rumblings I hear that there's a book coming out about you later this year? My fundraiser/cat fashion show will be in August at which time my new book will be presented. Lastly, name one thing about you most people don't know that might come as a surprise? I have a jealous streak. Have you ever visited the Algonquin Hotel in New York City and met one of the feline mascots? My human was at the Algonquin a few years ago, but Matilda was napping. Maybe we will stay there one of these days - I hear the hotel accepts pet guests! I don't know if I'd meet Hamlet if I stayed there (probably not if he is jealous), but I bet my human would! Hamlet is a handsome guy. Thanks for introducing him to us. We think it's cool that he gets to live at the hotel. Oh, Mudpie, Hamlet is a hunk of handsomeness! Thanks for telling us about him. One of the only incentives that would get me traveling and staying in a hotel would be the promise of meeting Hamlet! What a hunk indeed! 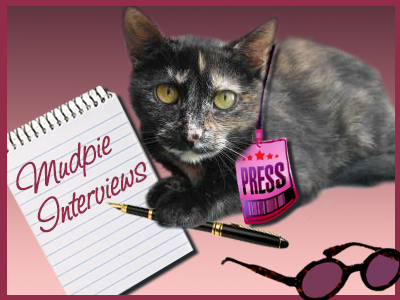 Terrific interview, Mudpie! I would love to meet Hamlet in the fur sometime, whenever I'm in New York City again. I sure Matilda give him all the ins and out of the job. Hamlet keep up the good work with the guests that check in. Thanks for the interview. Hope to see you in the fur one day. He's a total hunk, Mudpie! We wholeheartedly agree! Love the history of the ambassador-cats! Great interview. I got to meet Matilda in 2015 and I hope to meet Hamlet too. well I know where I am staying next time i am in NY!!! I never have, but now think, if I ever have to go to NYC, I'll look for a hotel with a resident cat! Oh my, Hamlet is over-the-top handsome! January we met Hamlet and he was very nice to us. Can't post the picture but we found him laying on his favorite luggage cart! I have had the pleasure of meeting both Matilda and Hamlet. Hamlet was still in training when I met him but he was still very sweet. Matilda was very much the elegant lady.